MANILA, Philippines – Mariing itinanggi ni Customs broker Mark Taguba na idinawit o idinadamay niya sina Vice Mayor Paolo Duterte at Atty. Manse Carpio sa isyu kaugnay sa “tara system” at shabu shipment sa bansa. 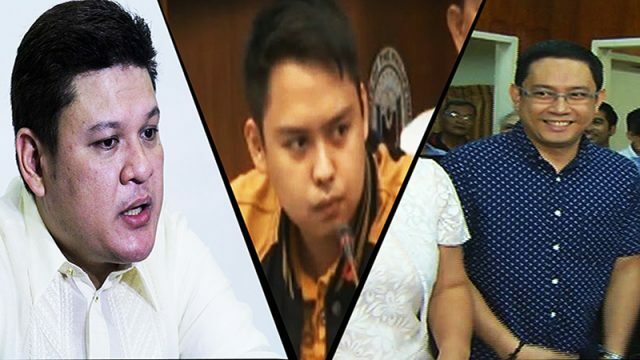 Ayon sa pahayag ni Taguba, nalaman daw niya na may kumakalat na maling balita sa social media na may kaugnayan sa kanyang mga naging testimonya sa kahapon (Agosto 31) sa Blue Ribbon Committee hearing sa Senado. “I had never testified, nor will I ever testify that Vice Mayor Paolo Duterte and/or Atty. Manse Carpio were involved in the shipment of illegal drugs into the country. Neither have I testified, nor will I ever testify that the aforementioned individuals were involved in the “tara system” that was in-place at the Bureau of Customs,” ayon kay Taguba. “The names of Vice Mayor Duterte and/or Atty. Manse Carpio were merely mentioned by the “Davao Group” whose direct contacts to me were ‘Tita Nannie’ and ‘Jack’. As I had repeatedly stated before Congress and the Senate, the alleged involvement of the aforementioned individuals are hearsay in nature,” dagdag pa niya. Hindi rin daw niya nakaharap nang personal sina Vice Mayor Duterte at Atty. Carpio para makipag-usap tungkol sa mga iligal na transaksiyon sa BOC. “At no time have I met either Vice Mayor Duterte or Atty. Carpio in person, much less discuss any illegal transaction at the Bureau of Customs with them,” ayon sa pahayag ni Taguba. “To this day, I contest that the container that my company caused to be released on May 24, 2017 contained the 605 kilograms of shabu. 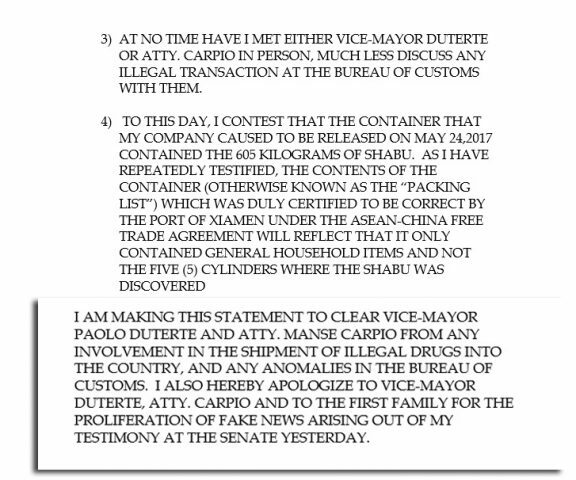 As I have repeatedly testified, the contents of the container (otherwise known as the “packing list”) which was duly certified to be correct by the port of Xiamen under the ASEAN-China free trade agreement will reflect that it only contained general household items and not the five (5) cylinders where the shabu was discovered,” dagdag pa niya. Humingi rin ng paumanhin si Taguba kina Vice Mayor Paolo Duterte at Atty. Manse Carpio tungkol sa pagkakadawit ng mga pangalan nila sa isyu. “I am making this statement to clear Vice Mayor Paolo Duterte and Atty. Manse Carpio from any involvement in the shipment of illegal drugs into the country, and any anomalies in the Bureau of Customs. I also hereby apologize to Vice Mayor Duterte, Atty. 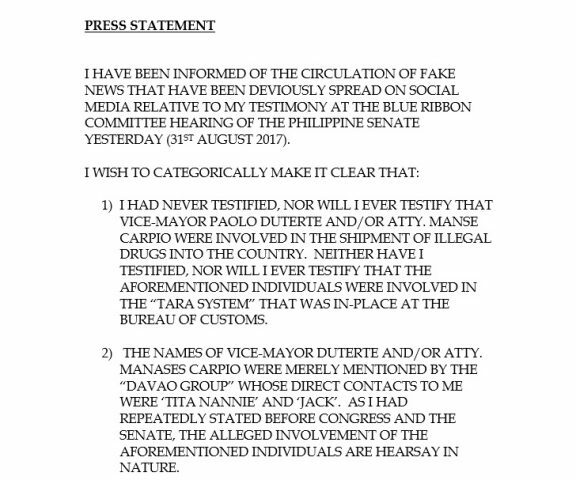 Carpio and to the first family for the proliferation of fake news arising out of my testimony at the Senate yesterday,” sabi ni Taguba.